On Tuesday, October 12th, Drago Centro will be debuting its new fall cocktail menu with special $8 pricing all day. Last week, Beverage Director Michael Shearin invited me, Caroline of Caroline on Crack and Esther from e*star LA to preview the latest menu of Nuovi Classici (“New Classics”), a collaboration with Head Bartender Jaymee Mandeville. Michael and Jaymee were actually ready to debut the fall menu earlier, but decided to hold off when L.A. was hit by the recent record-breaking heat wave. Thanks to brutal traffic I was running late, but luckily for Esther she had a Negroni to keep her company: Death’s Door Gin, Campari and Carpano Antica. I took a sip soon after I finally arrived; Esther definitely deserved that excellent cocktail for her punctuality. We then began tasting through the new cocktails as they’re listed on the menu, in alphabetical order. 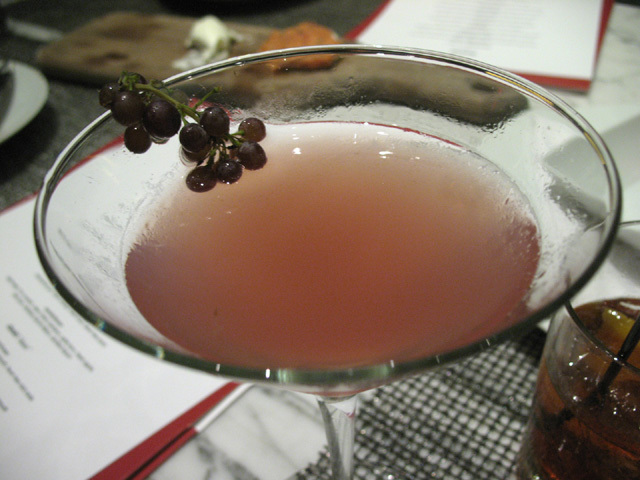 Autumn Night’s Dream – Martin Miller’s Westbourne Gin, Crème Yvette, St. Germain, fresh grapes and fresh lemon. Light and sweet, a nice way to begin our session. Cherry Poppin Daddy, take two. 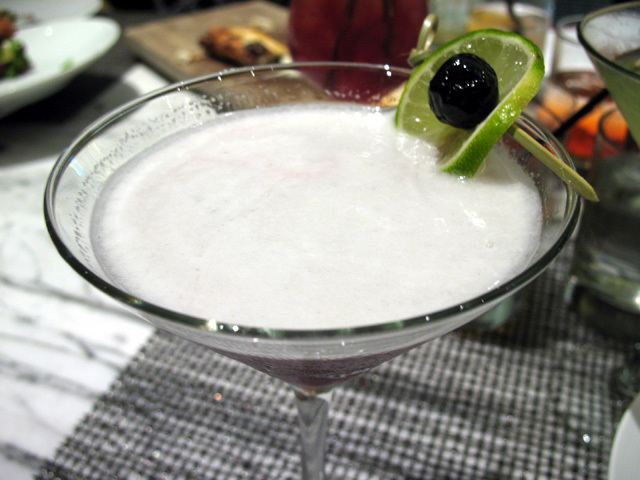 Cherry Poppin Daddy – Karlsson’s Vodka, Velenosi Visciole, fresh basil, honey, and lime foam. This one was somewhat of a work in progress, as Michael was perfecting the lime foam and working on a “lime cherry” garnish. 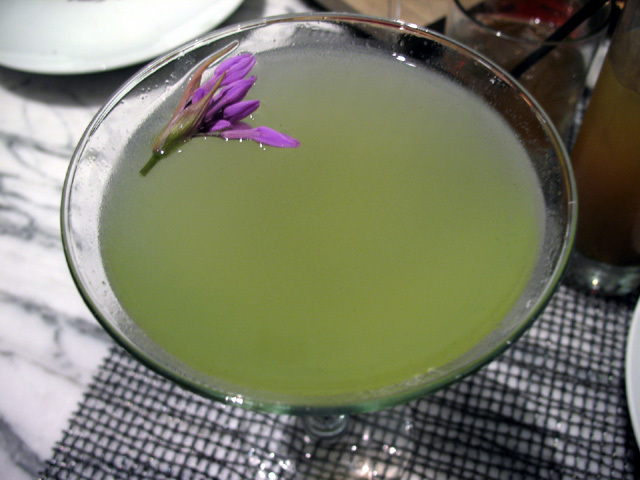 The first time this cocktail came out, the foam had solidified to a gelatin, while lime and sweetness overpowered the drink. Michael brought out another one later; the foam turned out as he’d intended and the balance was much better. Dazed & Confused – Casa Noble Crystal Tequila, Clement Creole Shrubb, Cherry Heering, fresh rosemary, Angostura bitters. Named for the global origins of its ingredients, the Dazed & Confused was a winner, nicely balanced between the tequila, the rich orange liqueur and the cherry brandy. Eponymous – Appleton Estate V/X Rum, Cruzan Black Strap Rum, orgeat, fresh lime. Plenty of full-bodied flavor in this one, a really enjoyable sipper. 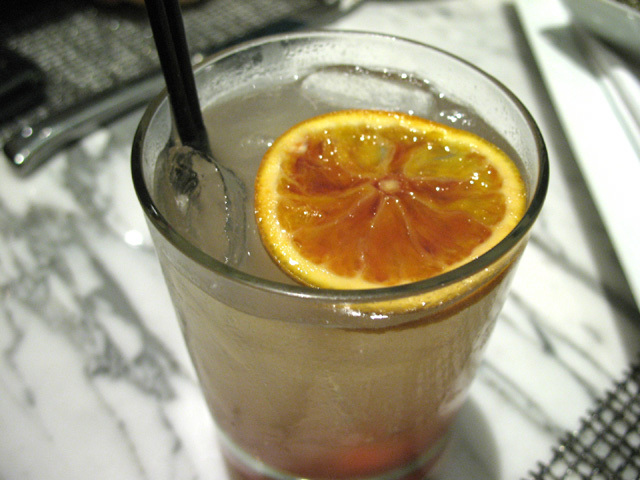 5th & Fig – Bertagnolli Grappa, house-made fig syrup, fresh orange juice, fresh lemon. 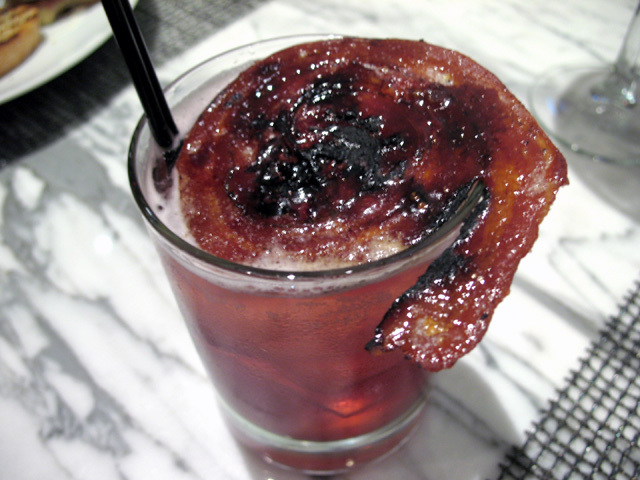 Since figs had appeared only briefly when this cocktail was featured on a previous menu, it makes another appearance this fall. Greco Roman – Lustau Amontillado Sherry, Luxardo Morlacco, Free Brothers Rhubarb Bitters. While I’m not a big sherry guy, the Greco Roman’s flavor profile would make for a nice digestif, especially the way it’s served neat in a small rocks glass. Rimedio del Pazzo (“Remedy for the Crazy”) – Zaya Gran Reserva Rum, Cynar, fresh sage, white peppercorns, fresh orange juice, fresh lime. A cocktail that’s right up my alley in its flavor profile, though the Zaya could be featured more prominently as the bitter Cynar is not for everyone. Case in point, Caroline and Esther were more than happy to let me finish the drink. 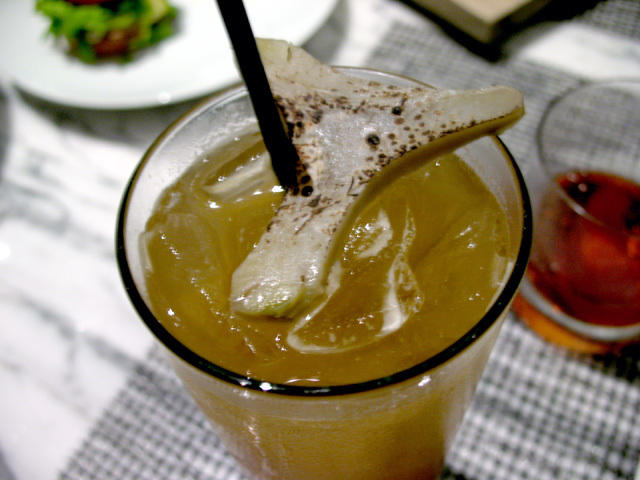 The eye-catching garnish is an artichoke heart, a nod to the Cynar. 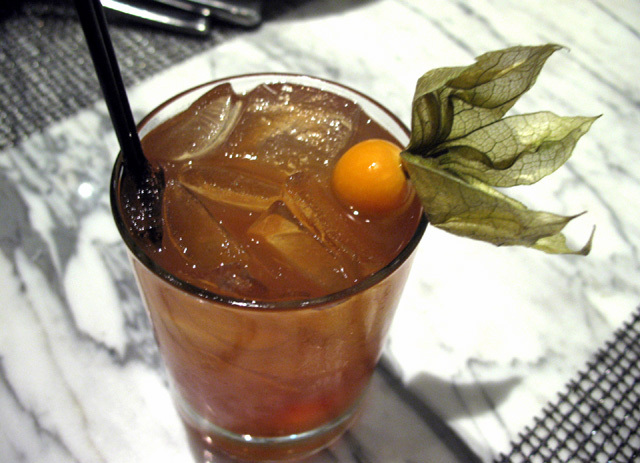 Sera Toscana (“Tuscan Evening”) – Belle di Brillet Poire Cognac, Benedictine, Brancaia Sangiovese, fresh ginger. I won’t be able to do justice to Michael’s poetic description of what he wants the Sera Toscana to evoke, but you should imagine a lovely Italian sunset with this sangria-like cocktail in hand. 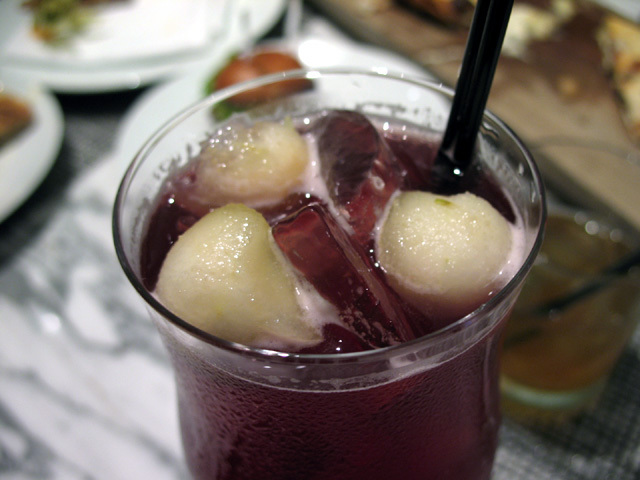 The pear balls hint at the cognac and match well with sips of the Sera Toscana. Smitten with Britain – Tanqueray Gin, fresh chives, fresh lime, Fever Tree Tonic. Chef de Cuisine Ian Gresik told us he suggested chives as an initial cocktail ingredient to Michael. The Smitten with Britain’s bright color comes from the muddled chives, which gives a nice depth to this Gin and Tonic variation. 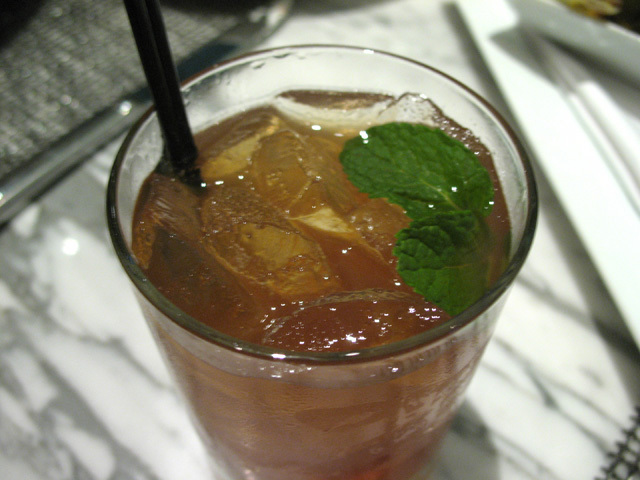 Smokehouse – Laphroaig 10-Year Single Malt Scotch, Clear Creek Cranberry, Apfelkorn, fresh apple, Fee Bros. Whiskey Barrel bitters, candied bacon. Garnishes don’t come more striking (or more addictive) than the spiral of crunchy, caramelized bacon adorning the Smokehouse. I didn’t get much of the apple, but the smoky Laphroaig, cranberry and bacon crack offered plenty of flavor. 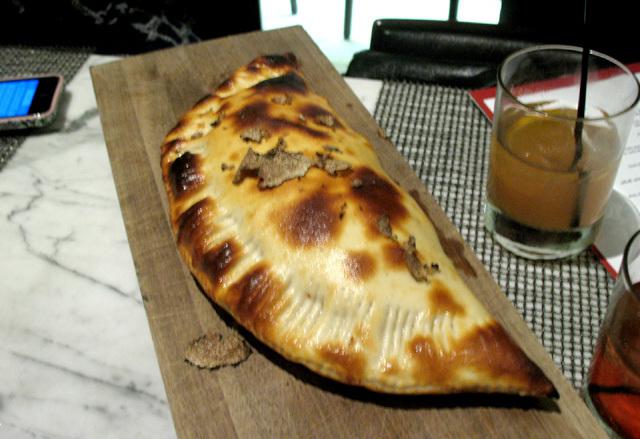 Calzone with ricotta, mushrooms and truffles. As if all the great cocktails weren’t enough, Michael also sent out several appetizers throughout the tasting, including a massive calzone (filled with ricotta and mushrooms, topped with truffles) that he carved tableside. Then Pastry Chef Jashmine Corpuz greeted us and brought out tastes of a few of her wonderful desserts, including La Torta Caprese (chocolate torte, port caramel, figs, praline gelato) and La Crostata di Pinoli (pine nut tart, pear rosemary sauce, goat cheese gelato). As with the best of the new Drago cocktails, Jashmine’s desserts were delicious layers of flavor and texture. Michael and Jaymee have created a fall cocktail menu that offers something for everyone, from sweet to savory, smoky to bitter, featuring a global array of spirits and ingredients. The affordable $8 pricing of Tuesday’s launch is a great opportunity to delve deep into the new menu. Disclosure: the cocktails and food for the fall cocktail menu preview were comped by Drago Centro.